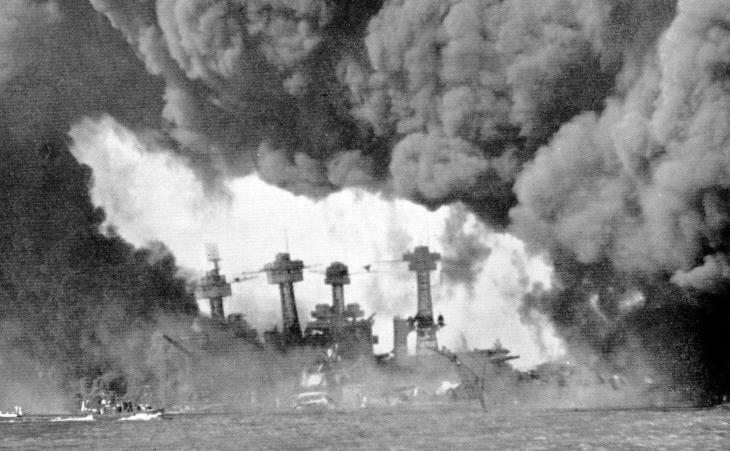 Five of these six (all except Mississippi) had been present at Pearl Harbor on Sunday7 December 1941, at the time of the devastating Japanese surprise attack, and all five had been hit in that attack - California and West Virginia being torpedoed and actually sunk at their moorings. Three of these five - West Virginia, California and Tennessee - were not only repaired, but were very extensively reconstructed before they rejoined the fleet, and it was these three, equipped with Mark-8 fire-control radar (more advanced than that carried by the three others) which played the main part in the battle-line action in Surigao Strait. California and Tennessee were sister-ships, each mounting twelve 14-inch guns in four triple turrets. West Virginia - a ship of slightly later design - while otherwise almost identical, had a main armament of eight 16-inch guns in four twin turrets. After their very elaborate reconstruction these three ships each mounted 16 five-inch dual-purpose guns in twin mounts, and large numbers of 40mm and 20mm light anti-aircraft guns. (California, for example, carried 56 x 40 mm guns in quadruple mounts, plus many 20mm in single mounts). Their underwater protection was greatly enhanced - huge anti-torpedo bulges were incorporated, hence the great beam evident in the photograph of the reconstructed Tennessee below. In Surigao Strait West Virginia made the greatest contribution of any battleship to the weight of fire on the Japanese force, firing 93 sixteen-inch shells, while Tennessee and California respectively fired 69 and 63 rounds of fourteen-inch.